So, today was yet another crappy day >< It's just a spiraling chain of events, I'm telling you. Thought I was feeling better yesterday, being all productive like at the shop, then I woke up, came to school..
And some assface swiped my pencil case. I'm not totally broken up about it, more pissed than anything (I was at the point where things ceased to be upsetting and just got frustrating), but I lost a bunch of time wandering around the LC looking for it, ran to security asked there, went all over the place, and no dice. Turns out honour isn't as prominent in college as I thought it would be. Anyways, I considered going up to Andreas, but I was like.. where's the point? So I proceeded to go to first period, and.. sit in the hallway for some stretch of time. And then Andrea showed up, who I explained why I hadn't come to see her that morning, and she hands me one of her gouache comics.. the one from christmas where she THOUGHT she asked me to close the door in proper english, but really just mumbled nonsensically at me where the only word I could understand was "Yes!" And I had a good chuckle over that. She also pulled this spiderman notepad dealer that she had brought back to toronto from home, once again.. just for me. So those personal surprise presents this morning made the day that much more manageable with me having gone and lost all my stuff. Anyways.. the artwork of the day.. I got this idea the moment I used the word "Piglet" in the RP Sarah and I run together. Ain doesn't like PEOPLE, but animals are a different story. 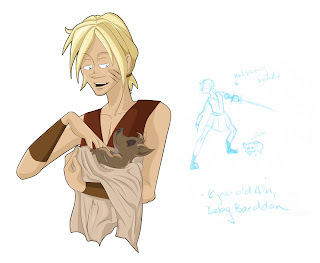 It was kinda neat how I was working on this in the LC (where my pencil case got nabbed), realized I didn't know what to do with his arms, and went to class, where Sarah handed me the baby (Baeddan) boar ATC, and the little connection i drew there made me happy too. Ainmire is now left handed (because I keep screwing up when i draw him), his scars are now the result of a run in with a Chupacabra (yeah.. screw you bear), Baeddan is seven years old, and Ainmire raised him from an itty bitty piglet when he was sixteen. Hence the reason the two get along so well!